Stenner Peristaltic High Pressure metering pump and Tank. 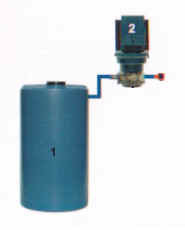 This injection system comes with one of the must prestigious injection pumps in the market today. The Stenner® High Pressure Pump. Available in adjustable or fix rate models. Choose from 85 Series Stenner Pump system with Output range from 0.3 to 17 GPD model 85MHP17 or 85MPHP17. Stenner Pumps come with a one year warranty and you will be amaze of its performance and durability. The chlorinator system is also equipped with a rust resistant chemical storage tank and a weather resistant Rain Roof Cover to protect the pump from weather agents. Stenner Pumps have being the market leader for 44 years. To obtain the expected results you will need to have a Retention tank to store the chlorinated water and increase contact time between the chlorine and the water. Stenner’s practical modular design saves valuable servicing time. All major feeder components are secured by stainless steel locking rivets, allowing the units to be disassembled quickly without tools. The peristaltic pumping action of Stenner feeders eliminates down time from loss of prime caused by gaseous solutions or troublesome degassing valves. Rather than relying on diaphragms or foot valves, Stenner feeders create a peristaltic flow with rotating rollers that compress and dilate the pumping tube. Hydrogen peroxide can be pumped without concern about vapor lock. Chemicals such as undiluted muriatic acid and chlorine can be pumped without harm to the system because they are metered without exposure to air or to moving mechanical parts. 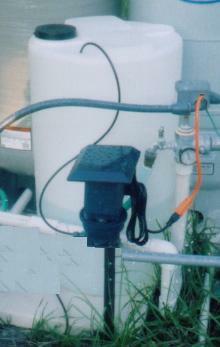 Since no hydraulic fluids are used, there is no possible leakage to the chemicals being metered. Maximum Discharge Pressure: 100 PSI (6.9 bar). Adjustable up to 17 Gallons in a 24 hr period (17GPD). Available Voltage: 120V 60Hz - 220V 60 Hz. Lexan ® Polycarbonate Plastic Housing. Santoprene ® TPR-NSF Listed Peristaltic Tube. LDPE Polyethylene-NSF Listed Suction/Discharge Tubing. Type 1 Rigid PVC-NSF Listed Tube Fittings, Connecting Nuts, Check Valve Fittings, and Ceramic Weight Clip. Non rusting, weather resistant rain roof Cover. Maximum output rate 17 Gallons in a 24 hr period (17GPD). If you only need the injection pump, you can take advantage of our great prices in the Stenner Peristaltic Metering Pump. You may also get the chemical storage tank by itself.